This post may contain affiliate links. Please read here for more information. 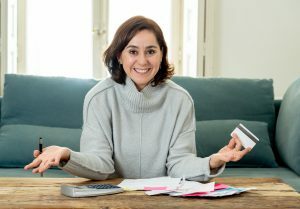 Women are starting their own businesses at a fast-pace these days, and many start home-based freelance businesses because of the low start-up costs and freedom to control their time. Other reasons for starting a business vary from wanting more creative freedom to wanting to be present when their kids get home from school. Whatever the reason may be, the possibilities are endless with technology, social media, and a laptop. 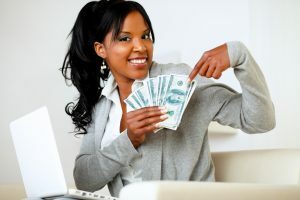 As a single mother, this could be a viable option for you to earn extra money for your family and leave your job one day if that’s your desire. But don’t just start a business without determining your reason or your “why” for doing so. Even if it’s your side business, there’s a huge responsibility that comes with business ownership. To keep yourself determined and motivated, you should write down your reason or “why” for starting your business. As for me, I started my own business to earn side money to pay off debt and to eventually save at a faster rate than I could with my career as a public health professional. And this brings me to my next point about the importance of writing a business plan. It’s smart to lay out your vision, mission, values, and goals for your business. It helps to lay the foundation for your work and a path forward. Since you’re not starting a freelance business as a hobby, your business plan also lays out your marketing and earning strategies. Your business plan is essentially your reason or your “why” for starting your business laid out in concrete and actionable steps. If writing is your gift, you can write for blogs, online magazines, and businesses. What do you enjoy writing about? Do you have knowledge in a particular area? Start by looking into your favorite blogs and magazines to see if they have writing opportunities and then venture out from there. Don’t forget to research your favorite businesses. They may need blog writers who can write content about their products or services as well. Graphic Designers usually have educational or professional training but some are self-taught. Many start out working for other companies in graphic design. If this is you or if you are a creative at heart, this line of work may be ideal for you. With all of the blogs and online magazines out there, I see people looking to contract with Graphic Designers all of the time. I can do very basic graphics for my blog but I can’t wait for the day that I can pay for those services on a regular basis. So, work is plentiful but you have to be skilled and develop your own marketing plan so you can be found by those looking for your services. Visuals are important to an online influencer’s or blogger’s work. Several months ago, I conducted interviews by phone with some extraordinary single mothers. I went in search for someone to transcribe those recordings for me and found the perfect person. Is this something you’d like to do? Do you have the patience to listen to recordings and accurately transcribe the information? Online content creators are making full use of their content on all platforms. So, a video may need to be transcribed for a blog post. Some may need a podcast transcribed for show notes. Lawyers need interviews to be transcribed. These are just some examples of work available in this area. The great thing is you get to decide what type of transcription services you will offer. The business of being a Virtual Assistant (VAs) is exploding right now. Many businesses and bloggers are hiring VAs to handle various kinds tasks as their businesses expand. The great part about this is you get to define what type of work you’ll offer as a VA and then market yourself from there. This work is done remotely. So, as long as you have a good laptop or desktop computer, you’re well on your way. Some VAs handle only administrative tasks like answering phone calls, scheduling, billing, etc. Others may only handle social media accounts or edit blog posts. Your work will depend on your business model and the requirements of those you seek to work with. If you think a VA business is hot then you need to check out website development. Because I am a blogger, there isn’t a day that goes by where I don’t see someone seeking the services of a website developer. Invest in quality training and stay on top of industry news. You want your work to be stellar. Word travels fast so if you’re a great website developer, you’ll get recommended to others. I have two friends who have gotten into Photography over the last few years and they are now masters at their craft. You can learn about photography from your local community college or work as an apprentice under an established Photographer. You can also teach yourself. There are a multitude of resources out there on the subject. While learning this skill may require some time outside of the home, once you get going, you can run your business from home. Maybe even set up your own studio at home if you’d like. You’ll need a great camera and a website to showcase your work. One of my friends recommends the Canon EOS Rebel T6 DSLR camera because it’s easy to use. To build your portfolio, ask family and friends to allow you to give them a photo shoot as a gift or offer a discount. As soon as they see their beautiful photos, they’ll be excited to tell their friends about one of the best freelance businesses in town! Do you have a knack for seeing the gifts in others that they may not see? Do your friends always seek you out for advice? Are you one who believes in getting things done? Life coaching is a skill that not only comes with training but with an inner desire to help others succeed. There are different types of life coaches – relationship, career, lifestyle, etc. Again, you get to decide which path you take. Research certification programs. Talk to others in the field. Read up on life coaching as a career. This is one of the great freelance businesses for those with a teaching background or if you’re just smart in general. When school is in, parents are always seeking tutors to help with their kids homework or maybe to help them in a particular subject area. Many times adults are looking for someone to help them develop or enhance in a certain area such as learning a new language. Tutoring can be done in-person (at your home or the person’s home) or online via an application like Skype. Again, you get to decide how to run your business. It’s no doubt that people like to travel. While some make their own travel arrangements online, others are happy to pass along that job to a professional. You can find work as an independent contractor for a travel agency or start your own. You’ll mainly need a phone and a computer. While formal training isn’t required, you should research what it takes to become a successful travel consultant. This may be one of the most popular freelance businesses. Another hot business that’s exploding because of technology and social media is Social Media Management or Coordination. For many online influencers and bloggers, they’re just too busy to do the everyday tasks when it comes to their social media accounts. They need someone to schedule posts, answer customer service questions, develop a strategy and so much more. With a love for social media and some training, you could start a freelance business as a social media manager right from your home. 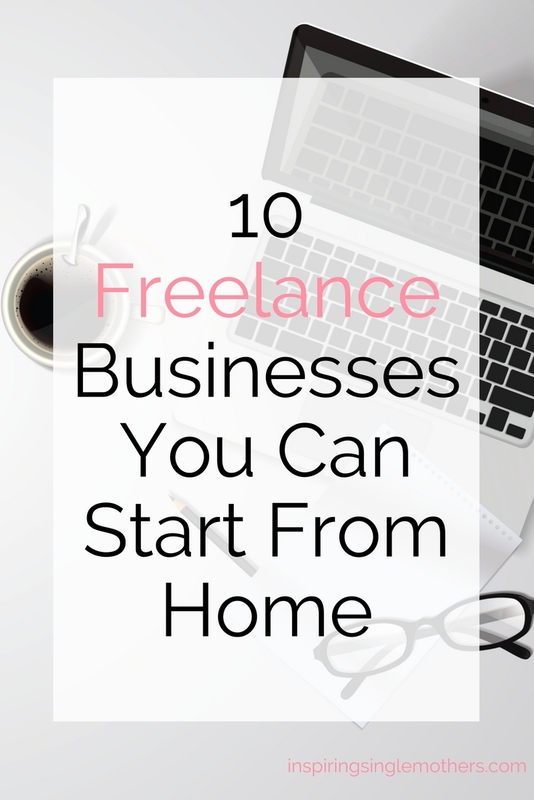 As you can see, these ten home-based freelance businesses enable you to work from anywhere as long as you have a laptop. Since it’s your business, you get to define each business model and the services you will offer. Some of these may require education or training, but many only require your willingness to research and start the work. Determining your “why” for starting a home-based freelance business helps too. If you have a reason for doing something, it helps you to not give up so easily when business is slow or when too much work may be coming in. As I stated early, my “why” was because I wanted to pay off debt faster and save money at a faster pace. Name some other home-based freelance businesses. Would you like to start one some day? I love all these ideas! Writing for blogs is my favorite of course, but VA work can be pretty profitable too. I heard transcription work is harder than it sounds but it’s a real job so you just need to be trained and develop your skills. Yes Chonce, indeed! I hired a transcriptionist once and she did a fantastic job doing something I certainly didn’t want to do. You have to really be committed to it. Thank you for stopping by! Do it! I’m looking to add a different stream as well. Those are some excellent ideas. There’s a lot of money that can be made with freelance or blog writing. You just have to make sure you find the right client that is willing to pay. Hi Jason! Absolutely! With any of these, you have to put in the work to make it happen. Love what you’re doing at The Butler Journal! I’ll be sure to visit often.